Get Ready for MedFest at Fall Games! On Saturday, August 10, 2013, Special Olympics Nebraska and Bryan Medical Center will offer MedFest at Abbott Sports Complex from 8:00 a.m.-4:00 p.m. MedFest is a discipline of Healthy Athletes that checks the overall health of our athletes through a sports physical. Each athlete will have their height, weight, and blood pressure measured, along with a brief screening of the eyes and ears. 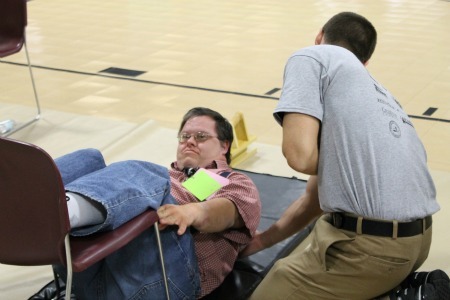 After these tests, a clinician from Bryan Medical Center will check their heart, reflexes, mobility, and strength and determine their level of participation in Special Olympics events. As a new regulation for participation in Special Olympics events, each athlete must have their medical physical information renewed every three years, and MedFest is the place to do it! This is a free screening offered to all athletes, whether or not they are participating in Fall Games. Please take advantage of this wonderful opportunity and visit us at our first MedFest event! Please contact Katie Novicki at knovicki@sone.org or 402-331-5545 x23 with any questions! We hope to see you on Saturday, August 10!